The Bulls a week into the NBA season were drowning in a sea of losses, injuries and frustration. Their rescue came Wednesday in the form of their personal flotation device. Those saviors were once known as Mae West vests. The Bulls will call them a Zach LaVine. 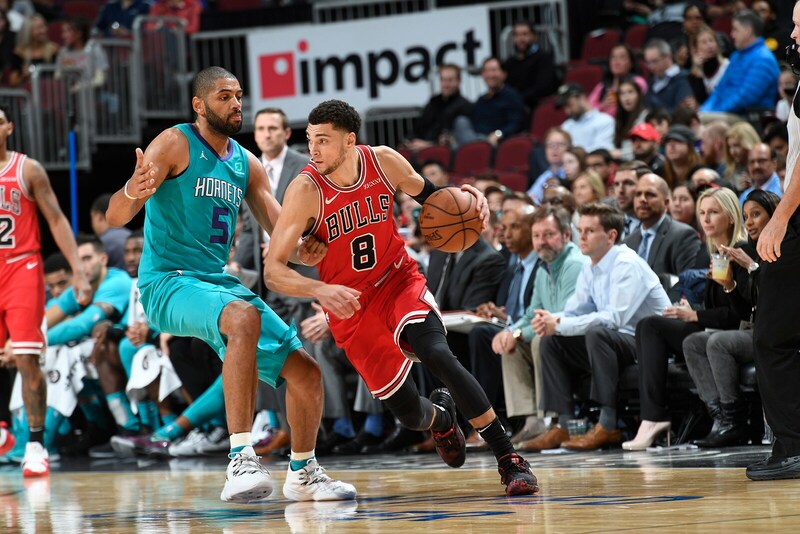 Scoring 10 of the team’s last 14 points over the final 4:38 including the game winning free throws with half a second left and making the decisive defensive play just before that, LaVine finished with 32 points and a team best five assists in the Bulls 112-110 victory over the Charlotte Hornets. The Bulls also got career highs of 21 points from Cameron Payne with seven three pointers and 10 points from Ryan Arcidiacono. Jabari Parker added 11 points and nine rebounds and the Bulls shot 48 percent with a 16-4 advantage in fast break points. But they were about to blow an 11-point second half lead, falling behind 103-98 with five minutes left when LaVine effectively willed the Bulls to their first win of the season. They are 1-3. Charlotte is 2-3. The Bulls play in Charlotte Friday. With his fourth consecutive game of at least 30 points to start the season, LaVine matched a franchise record held by Michael Jordan. We’re hesitant to make comparisons to arguably the game’s greatest player ever, but the 23-year-old, 6-5 shooting guard bore some resemblance perhaps less with his continued impressive scoring than the way he launched his own salvage operation. He was not letting the Bulls lose again. We’ve seen that before, though not often. In a game in which LaVine’s shot wasn’t as accurate as in previous games, the explosive guard drove for scores three times around yet another Payne three and then dropped in a 17 footer to tie the game at 110 with 53.5 seconds left. But it looked like another unhappy conclusion when the Hornets got the ball with 6.2 seconds left following misses by Miles Bridges after Parker forced the ball out of the hands of Hornets star Kenba Walker and LaVine at the top of the key from 22 feet. The Hornets’ Nic Batum was inbounding from the left sideline near the top of the three-point circle. The pass was to come to Walker for the last shot: Hornets winner or overtime? Defenders usually lay back and then pressure the player with the ball. Instead, LaVine trailed the speedy Walker from near the baseline at the far side of the lane to the top of the key. LaVine dashed past the screen and overplayed the inbounds pass, knocking the ball out of bounds and off Walker. The officials reviewed and the ball remained with the Bulls for their last shot or overtime. Parker inbounded from the side sideline, dropping the ball on top of the floor to LaVine, who was defended by the rangy Batum. Parker did a good job screening Batum. The two worked off one another effectively in pick and roll much of the game in what was probably Parker’s best all around effort. LaVine got picked up by the athletic Bridges, but it proved a bridge too far for the Hornets. LaVine went into a balletic spin left that left Bridges collapsing. That opened a lane to the basket for LaVine with Walker and Malik Monk trying to squeeze LaVine and Marvin Williams at the basket. It was a poor defensive setup with such small defenders. LaVine was too quick for them, getting to the basket and fouled hard. LaVine raised his two hands in triumph as he continued out if bounds. Multiple Hornets players held their head in their hands in despair. They also knew. LaVine was shooting 83 percent on free throws coming into the game and headed for a career high 11 makes in 12 attempts. With a half second left, LaVine swished the first free throw. Coach Fred Hoiberg then signaled for LaVine to miss the next one. Since a minimum of three tenths of a second has to go off the clock on a rebound, Charlotte could only have time left for a tip and not a shot. This is how locked in LaVine apparently is: He fired the ball off the backboard. But it banked off the front rim, off the backboard and in. LaVine looked to the bench in disbelief. So Charlotte with a half second left still had a chance. Monk lost Arcidiacono off a screen getting the ball on a curl. But Wendell Carter Jr., who had difficultly on offense again, came out on a strong contest to force Monk into an air ball to end the game. Yes, even Hoiberg could finally joke with the Bulls first win of the season. 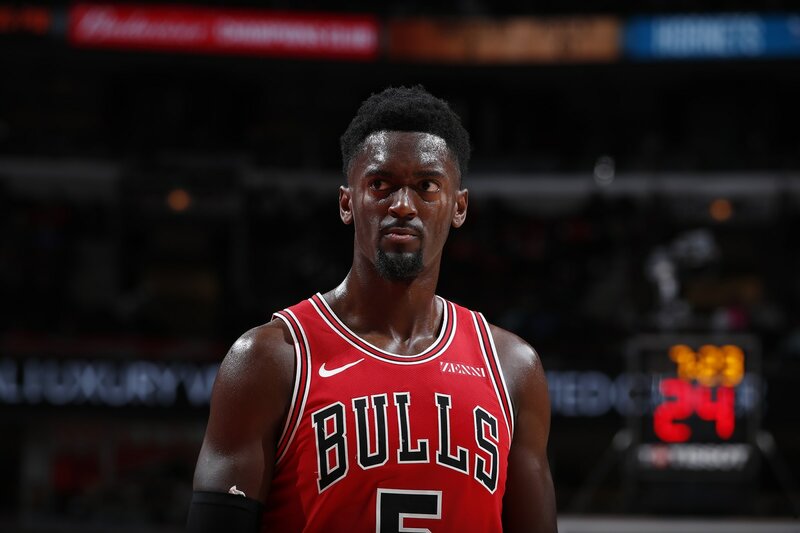 But it also was painful with an apparent knee injury to Bobby Portis early in the fourth quarter when Tony Parker fell into Portis’ right knee. Hoiberg said Portis would get a scan Thursday, but the Bulls appeared concerned. With Lauri Markkanen still out, it seemed likely Parker would now have to move back to the starting lineup at power forward, at least temporarily. Plus, Payne had his career game starting for the injured Dunn, who is expected to miss four to six weeks with a medial collateral sprain from Monday’s game in Dallas. If Payne and Arcidiacono play like that, Dunn can take his time. Though Hoiberg, as expected, said it was about matchups, another sea change seems to be coming. Cristiano Felicio played backup center with Robin Lopez not playing. Felicio was impressive with nine points in 16 minutes and Chandler Hutchison again got the backup time from Antonio Blakeney. Hutchison was his most aggressive with three second quarter scores on drives and finishes. He had eight points in 13 minutes. Hoiberg was talking about several scrappy plays in which Payne dove on the floor and wrestled balls away from Hornets players, leading to Bulls scores. Many of his threes, several from the left corner, resulted from pick and pop plays with LaVine, who was a primary ball handler much of the game. And it was a different Payne, who had not made a three in the first three games and was zero for two on threes in the first half. The Bulls had trailed 27-24 after one quarter with Charlotte making them look bad with ball movement and seven assists. 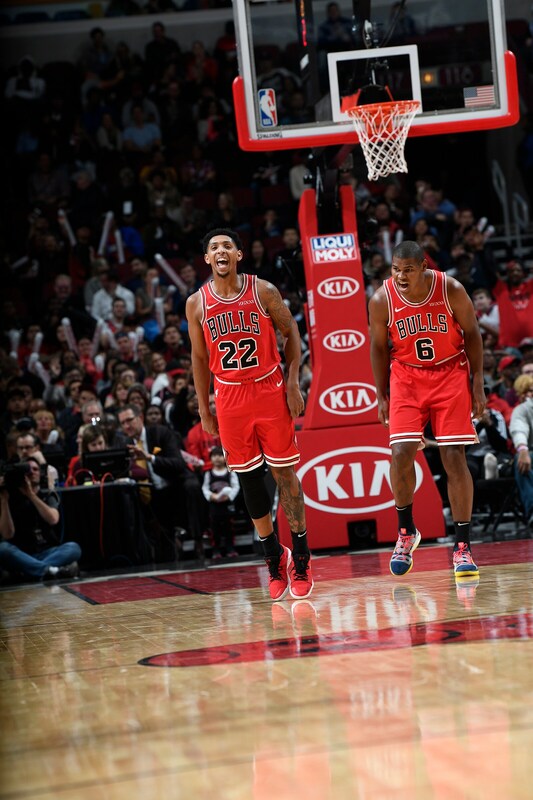 But the Bulls continued to shoot the ball well, 56 percent in the first quarter and 47 percent overall in the half to lead 54-53. Then it was the most amazing quarter of his career for Payne, making five three pointers, the last giving the Bulls an 85-74 lead with 2:40 left. The Bulls would go on to lead 88-82 after three. Though a 7-0 Charlotte run to start the fourth would quickly cause pain in another exciting game with 21 lead changes and 12 ties. Teammates seemed pleased for Payne, who has often been the loudest target of local critics since the trade for Taj Gibson. But Payne is proving vital with Dunn out again and is the team’s fourth leading scorer. And in Zach the Bulls trust. It’s becoming the Bulls motto and money for the team. LaVine is playing like one of the elite players in the NBA, top five in scoring, making clutch plays on offense and defense, an articulate and approachable spokesman for the team and natural leader. Which still did need a save from LaVine.